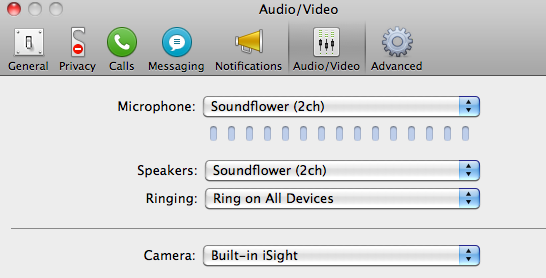 I finally had time to figure out how to record a Skype session using the free apps Soundflower, LineIn and Audacity. Thanks to 360east.com for the original post that helped me set this up. The directions on the 360east blog are for using GarageBand as the recorder. Check it out, too. 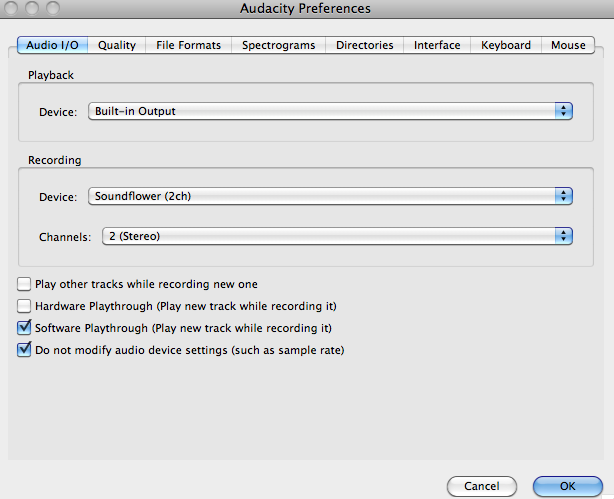 Audacity from Sourceforge. This will be our recorder. 2. 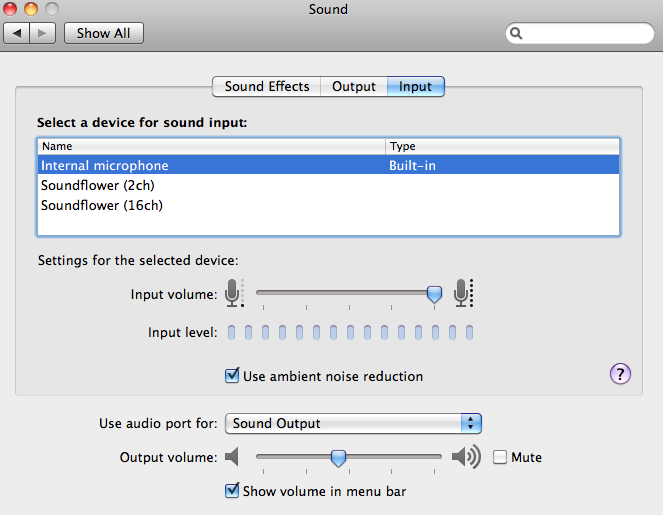 Configure the sound settings of your Mac. 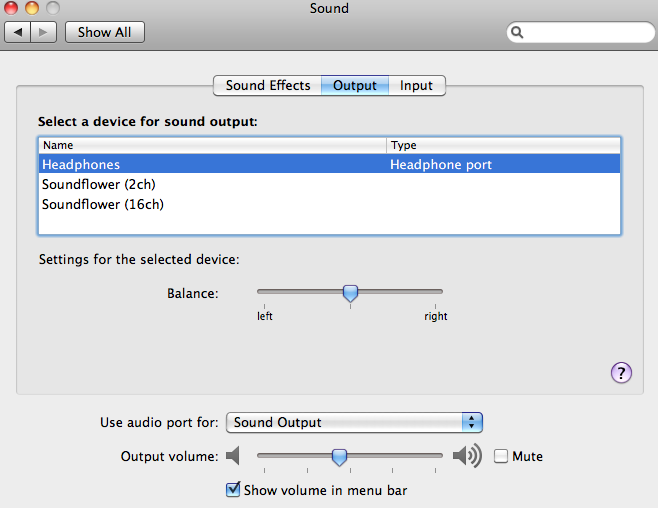 Click the Apple icon > System Preferences > Sound Output. Choose Headphones (or Internal Speakers, if you're not using Headphones). See screenshot, below. In the same window, click Input. Choose Internal microphone. Close the window. Run Audacity. 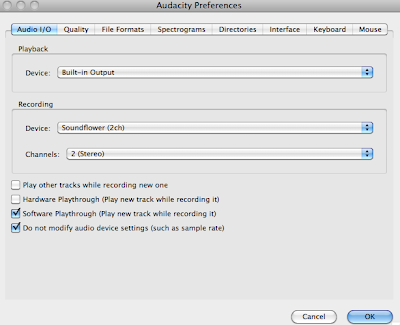 In the menu, click Audacity > Preferences > Audio I/O. 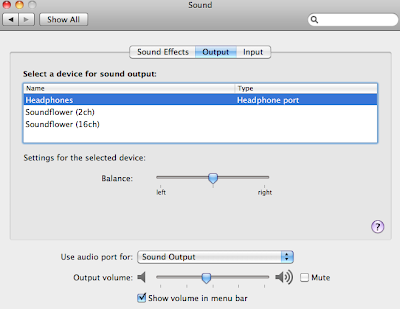 Set Playback Device to Built-in Output. 4. Configure LineIn (we're almost there). IMPORTANT: Click the Pass Thru button before recording the call. On playback, turn it off (if you're wearing headphones, be careful as this may cause deafening feedback). This redirects your microphone output to Soundflower, which in turn will be piped into Audacity. Using LineIn lets you record not just the people on the other side of the call, but also the sound coming through your mic. 5. Configure Skype (just a bit more patience). This redirects your Skype session to Soundflower, which in turn redirects everything to Audacity (our recorder). When you install Soundflower, you also install an App called Soundflowerbed residing in your /Applications folder. You can also use Spotlight to find it. 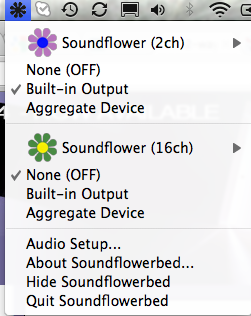 Soundflowerbed shows up on the upper right menu bar of Mac OS X. 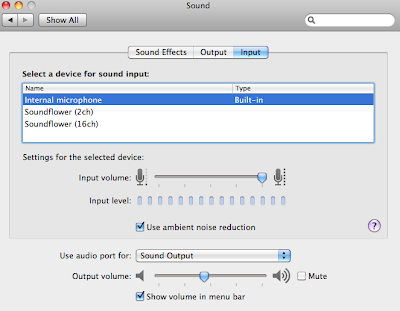 Check Built-in Output in the settings for Soundflower (2ch). Important: Leave the 16ch off (or you may get deafening noise!). 6. Hit the record button on Audacity. 7. Start your Skype session and have fun! Thank you so much! I was following someone else's instructions but they were using an external mic so it didn't quite work out. This, however, works perfectly. Hi, Thanks for your instructions! I did what you said but when I call someone they can't hear me, and Audacity can't hear me either. When I change the Skype microphone back to 'Built-in microphone' the other person can hear me again but I'm still not being recorded...?! Have I done something wrong? Hi, what would change if I used an external mic with Blue Ice usb converter (i.e., recorder both the Skype voice and my own on the same recording)? 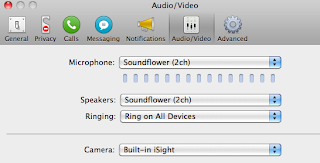 For the other Anon poster (Blue Ice), you need to go to System Preferences > Audio (or Sound) > Input and choose your external mic from there.